Too much of “religion” these days focuses on how a person “feels” and on the “worship experience” rather than Teaching the Truth. If the people in attendance experience entertainment, give generously, serve wholeheartedly, even love unconditionally, but leave the assembly with a dull sword and tattered armor, is that congregation fulfilling the mission of Christ? The assembly is like a training exercise though it should not be the only place we develop our skills for battle. The soldier of Christ needs to verify what the sergeant (preacher) says, dedicate him/herself to the study of the Word, and question anything said in opposition to the Word. The soldier does not (or should not) only do Physical Training (PT) with the unit at Dark Thirty, but also after hours and on holidays, to keep the body battle ready. Soldiers have a “battle buddy” and often remain connected and accountable to one another even after the danger of deployment is over. You would not walk through enemy territory without body armor (or battle rattle, as my soldier husband would say). We cannot be prepared for the spiritual warfare going on around us if we do not have the right equipment. You would not go into battle without first being trained. You would not stand on the front lines without an adequate weapon. Be battle ready, in all seasons. The Enemy prowls like a lion, seeking those he may devour. Don’t let yourself be his next meal. Learn so that you may teach others, freeing them from the Enemy’s snares. Does your congregation focus more on the experience of worship than the mission of Christ? Do you leave feeling good, but lack knowledge of the Word? If either of those is the case, I recommend opening your Bible and seriously studying to find God’s Way, rather than that of men. I’m almost embarrassed to admit this, but we just made a prayer box at home to use when saying bed time prayers with the kids. I just realized that it might be a good idea to put a Bible in there!! That was a close call! It makes me feel a little silly when I forget the most obvious thing too! I so enjoy my Bible reading time each day with Just God and I! Good thoughts here! I need to get back into mine! Great reminder here. I think it will resonate with many, as it did with me. Thanks for sharing! Joining you today from Wise Woman Builds! I do hope so. 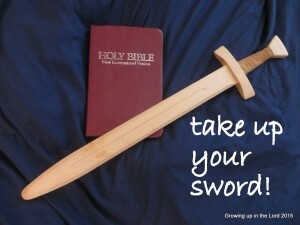 Moreover, I pray it challenges them to truly take up their Sword! Thank you for stopping by! Hello Angie, I love this. You wrote it with a military-styled preparation in mind. Ifeoma Samuel recently posted…10+ New Books Women Should Read in January! Being an army wife for a few years blessed me with first-hand understanding of those Scriptures that compare our Spiritual lives with that of the soldier in battle. I am glad you enjoyed it! 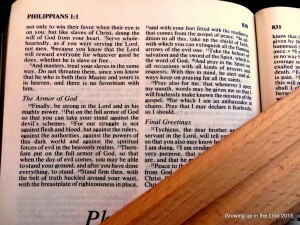 Several months ago, I decided that I needed to do more than read my bible. I needed to start studying it. I love watching how learning God’s word informs my life and choices more everyday. Not just a book, but my living breathing God building me up, breaking me down, cleansing me, and shaping me. And battle buddies are crucial. I am so glad you started fully seeking God. Bible study is so much more than reading the words on a page. It is a LIVING WORD and must be applied. Good thoughts! We are very blessed to be part of a church where the focus is on Scripture and individual relationships with Jesus… Granted I happen to really enjoy the personality of the pastor and the worship… but there is so much more, those are just nice bonuses. Thank you for stopping by and offering your view and experience. Charisma is an unnecessary charm, unless it’s really used for God. I’m certainly glad for anyone who finds such a balance. It is a sad fact. I encourage you to keep seeking God’s will and searching His Word for answers. Such a good post! So important that we are having a relationship with the Lord!!! While I do believe sometimes that might be an experience as we encounter the Lord I know it will also look different for everyone! An “experience” however is not the point of the assembly. Even the apostle Paul warned the first century church against having too many prophesy at a time and only if an interpreter was present. (Maybe an extreme example, but it fits).